Once your brand has joined Instagram, how do you keep your customers engaged? Founder and CEO of Engagor Folke Lemaitre shares his tips for the visual platform. Folke Lemaitre is the founder & CEO of Engagor, a comprehensive platform for real-time customer engagement. It provides brands and enterprises with a powerful tool to monitor and analyze their social channels in order to efficiently engage with customers. 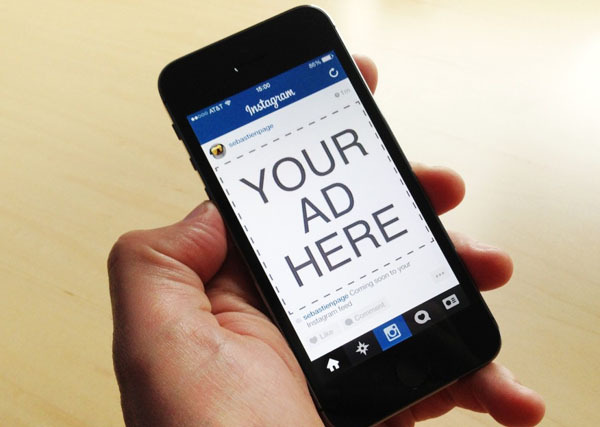 Instagram is rapidly becoming a key social platform for brands to build awareness. Recently released stats show there are now more than 200 million active monthly Instagram users sharing 60 million photos daily that generate 1.6 billion Likes. In fact, Business Insider reports that U.S. users spend eight billion minutes a month. With that many people scrolling through their social feeds, there is plenty of opportunity for brands to increase visibility and maintain a strong presence with customers. However, more than 70 percent of the most-recognized brands are fighting for Instagram attention on a daily basis. And, it’s not just about the number of Likes they get or how large their following is: It’s about attracting engaged fans and ultimately increasing customer loyalty. With the stakes so high, how do you set yourself apart in such a crowded social space? Bear in mind that customers on social media are most responsive to relevant and targeted information. Simplify your Instagram marketing efforts by dedicating special hashtags to your campaigns that will better serve discovery. With hashtags, users feel connected to each other and the brand by identifying a unified topic. They are likely to engage more once they feel others are interested as well. The brand includes creative captions with whimsical hashtags that complement their posts and invite users to explore and engage. These captions will ignite conversation and present your content in a unique way. Even if your company isn’t as high profile or well-known as others, there are many creative ways to start a conversation about your brand. If you’re at a loss for inspiration, turn to the bigger brands on Instagram to help you discover new ideas. 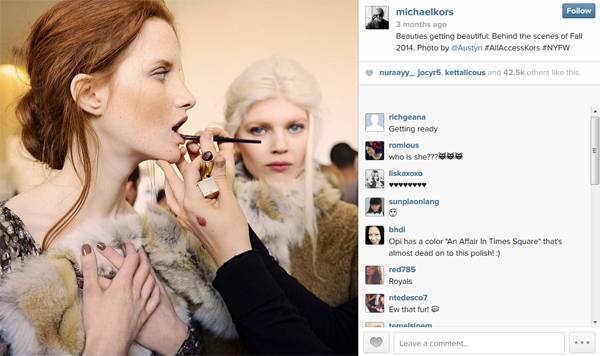 For example, Michael Kors generated some major Instagram buzz during Mercedes Benz Fashion Week in February. This is an internationally-known event, with many big-name designers competing for attention, but the Kors brand successfully gained nearly 50,000 new Instagram followers that week with its #AllAccessKors dedicated hashtag campaign. While many designers post items from a new collection on Instagram, what really set Kors apart was its approach to social outreach leading up to the runway show. The team took social content marketing and building brand awareness to the next level. Instagram followers were not only able to get an exclusive glimpse of the show’s production, the models backstage and the front row celebrities, but also an up-close look at Kors’ much-anticipated Fall 2014 collection. Once you’re at the stage of acquiring those highly-coveted Instagram followers, it becomes critical to keep your audience engaged. So, how do you continue that journey with your followers? With social media, there’s a short shelf life for any piece of content, especially if it comes across as self-serving; people can easily get bored. It’s not enough for a brand to just show off product images. What really captures people’s attention is user-generated content. Make sure to sporadically switch between brand-focused content to customer-focused content to keep your audience involved. Pay attention to what your followers are interested in and talking about on your feed, and make your photo-sharing relevant for them. Invite them to submit images featuring your product to highlight on your Instagram feed. Giving customers a little personal attention will go a long way in keeping them actively engaged. Any business, whether it’s a smaller company or an internationally-known brand can easily leverage Instagram to adopt a transparent company culture and encourage conversation from customers. Your followers will instantly reward you with a valuable connection that builds brand exposure and keeps you relevant.